Live Theater Production: Les Miserables! “Les Miserables” – a musical by Alain Boublil and Claude-Michel Schonberg. Based on the novel by Victor Hugo. Directed by Jim Weisman. With a riveting score and a memorable story, Victor Hugo’s masterpiece is brought to life as ex-convict Jean Valjean, who becomes a force for good in the world, cannot escape his criminal past. Couple weekends ago, I went to the Fredericksburg Theater Company’s live production of Les Miserables. I LOVE this musical and the book by Victor Hugo from which the story originated. I had seen the film versions of Les Mis, and honestly, had some very high expectations when arriving at the theater on opening night. The atmosphere of the tiny local theater is modern and comfortable. They served us local wine (which unfortunately was not good) and a selection of hors d’oeuvres including bacon wrapped asparagus and bite-sized cake delights at intermission. My high expectations of the event and production were tapered with the knowledge that this was only a local play with local, volunteer thespians. I knew there would be quirks that stemmed from a lack of professionalism in some manner, but what I did not expect was to be blown off my feet by the talent that walked out on stage. I feel ashamed, honestly, of the low standard that I immediately placed on the production. Each scene was phenomenal with actors whose voices exploded on stage and captured the entire audience. I was left with goosebumps after numerous solos, and have not regretted purchasing my ticket for opening night since. Here are some pics from opening night. “Les Miserables”, a musical by Alain Boublil and Claude-Michel Schonberg. Based on the novel by Victor Hugo. Directed by Jim Weisman. With a riveting score and a memorable story, Victor Hugo’s masterpiece is brought to life, as ex-convict Jean Valjean, who becomes a force for good in the world, cannot escape his criminal past.” Take a chance at browsing their website [ www.fredericksburgtheater.org ] to find future shows (I hear they will be having auditions for Fiddler on the Roof soon! ), and getting your ticket in advance. It won’t be a waste of money and you will discover a secret world of talented locals with voices to share with the world. Enjoy! Pierre works as a chef at a bbq dive called Cranky Franks in Fredericksburg. 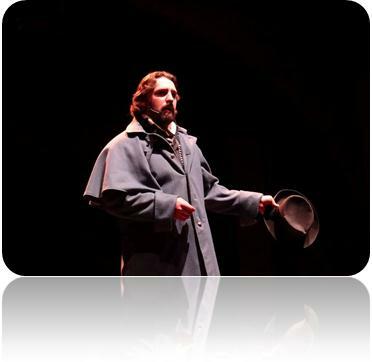 He is well-known in the local theater world and was caste as the lead for Jean Valjean! Vocals were outstanding and robust. Enjoyed every moment he was on stage. Can You Hear The People Sing? ?